After two races, Steph Bunnett leads the A women in the SECCC. After two of eight regular season races, Mars Hill remains on top of the SECCC D2 team rankings with 218 points, ahead of King College (109) and Mercer (97). In the individual rankings, Stephanie Bunnett leads the A women, with Klara Rossouw in 5th, and Yolanda Colon in 6th. Cassandra Adamson is 7th in the B women. Michael Robinson is 2nd in the A men behind Furman’s Andy Baker. Maitland Jones and Sebastian Scherf are in 9th and 10th. In the B men, Tim Jenkinson and Mikey Keith are in 8th and 10th. In the C men, Chandler Hill is in 13th. This was the team’s first big race weekend of the year. We brought 15 riders to Georgia Southern, which is a record for us. There was a sense of nervous excitement. Everyone received new kits from Hincapie and DeFeet, which was exciting. We were loaded up with energy drink from Ion Sports Nutrition and bars from Raw Revolution. And everyone was racing with new teammates for the first time, which is fun but presents some challenges too. The results were quite good, but we all learned that we have a lot of hard work to do if we want to maintain our #1 ranking and live up to our “Collegiate Club of the Year” award. We arrived in Statesboro (AKA the ‘Boro), Georgia, at about 11pm Friday night after a long drive was made a bit longer by a few wrong turns. Yes, the GPS was askew, and Statesboro is hard to find on a map, but final blame rests with the driver. Upon arrival we all got squared away in host housing provided by the Georgia Southern folks. Thanks guys: your floors, couches, and hammocks were comfy. Your kitchen was awesome. The team woke up early for a 9am TTT start, which was a 30 minute drive away. We started two men’s A teams and one women’s A team. Our fastest men’s team just missed the best time of the day by six seconds, eclipsed by a well-oiled UF team that is renowned for its TTT ability. 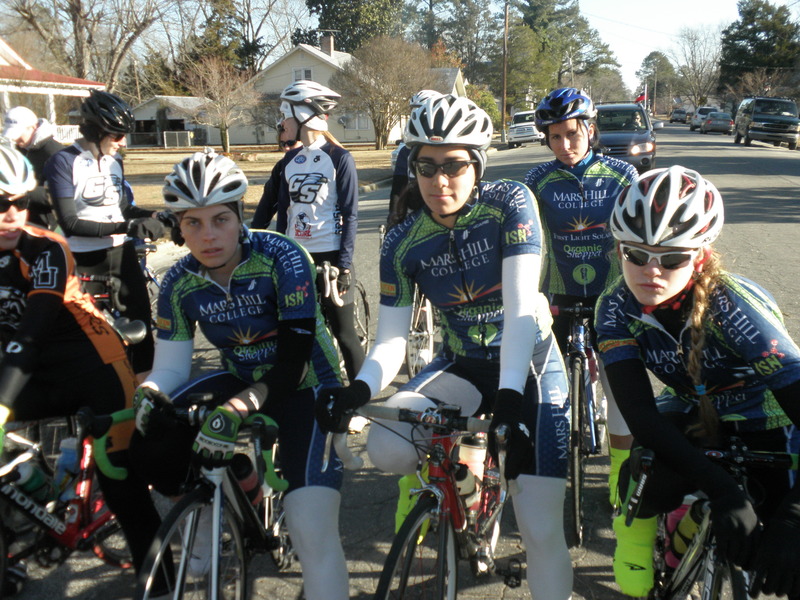 Our women’s team won uncontested, using the race to refine TTT skills and strategy. After a bit of pasta and sandwiches back at our hosts, we headed to the crit, which was conveniently located right across the street from our host housing. We entered riders in every category: Men A/B/C and Women A/B. In the men’s C race, Chandler Hill dived into a crit for the first time in a year and handled it quite well on the 1k course with 8 corners, a tough and technical course for any level of experience. Chandler finished 12th, happy, and eager for more. Next, the A and B women raced together for 30 minutes. After a fast-paced start during which Yolanda Colon helped to string out the field, Klara Rossouw and Steph Bunnett found themselves in a 5-woman breakaway. 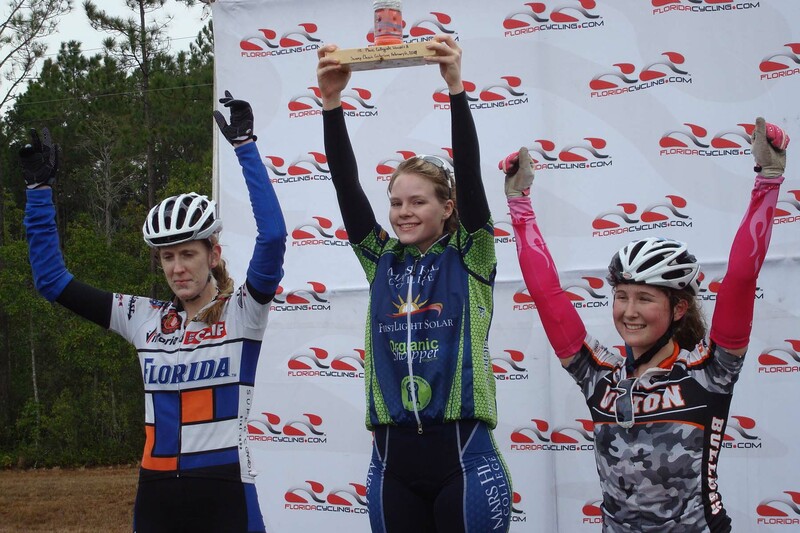 Our newest woman on the team, Cassie Adamson, a “walk-on” from cross country and track and field, did great in her first bike race ever. A natural athlete, she managed to hang with the main field and finished 4th amongst the B women. Up front in the breakaway, Rossouw and Bunnett noted that Amy Morrison (Clemson) was very strong and eager to do a lot of the work, so they planned to let her wear herself out and then attack in tandem with two laps to go. That plan was derailed when without warning they were given one lap to go. No lap countdown at all. Morrison and her Clemson teammate took off with Rossouw and Bunnett right on their wheels. The Clemson girl riding second wheel bobbled a turn, which held up Rossouw and Bunnett and allowed Morrison to take off with about 400 meters to go. Rossouw and Bunnett fought hard to bring her back by the line but came up short and had to settle for 2nd and 3rd overall. But 1st and 2nd in the A category since Morrison races as a B, although probably not for long. In the men’s B race, our South African mountain bikers, Tim Jenkinson and Mikey Keith, teamed up to show the roadies that they do know how to crit. After they both made the 5-man breakaway, Tim successfully fended off attacks in the closing laps while Mikey reserved his legs for the sprint. Mikey won by a couple of bike lengths and let out a victory whoop. This was Mikey’s first race with the team since arriving at MHC in January. What a great start. Rossouw, Colon, Adamson, and Bunnett before the start of the road race. In the men’s A race, we went in feeling quite confident, maybe a little too confident. We had eight riders out of thirty-two starters in field. Having 25% of the field, we figured we’d be able to control the race and work for a selection that would put us in winning position. When a three-man break got away containing some of the conferences strongest riders (Andy Baker/Furman, Alejandro Padilla/Cumberland, and Beck Frydenborg/UF), we panicked. We started chasing, which was the right thing to do, but we failed to communicate and organize our chase properly, and the smoothly working break slowly took time out of the field. In the end, we were left racing for 4th, and managed to put just two riders into the top ten in 6th (Sebastian Scherf) and 10th (Michael Robinson). 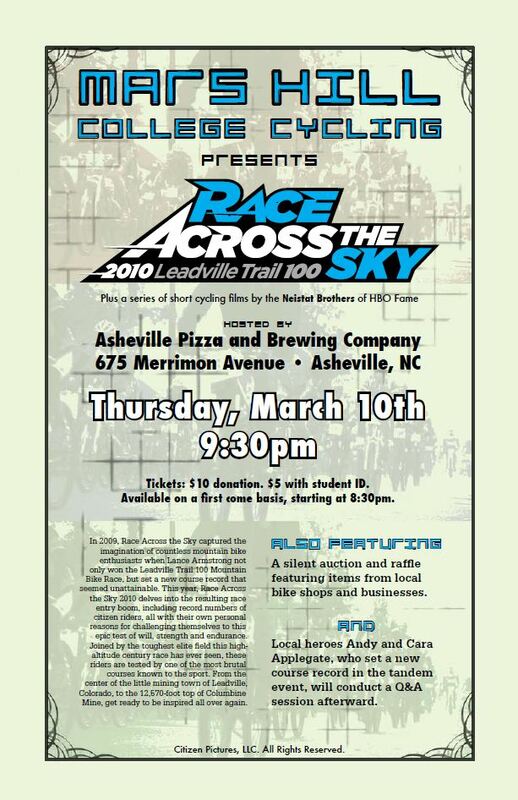 At a post-race team meeting, we talked about what went right and what went wrong and made plans for redemption at the following day’s road race. 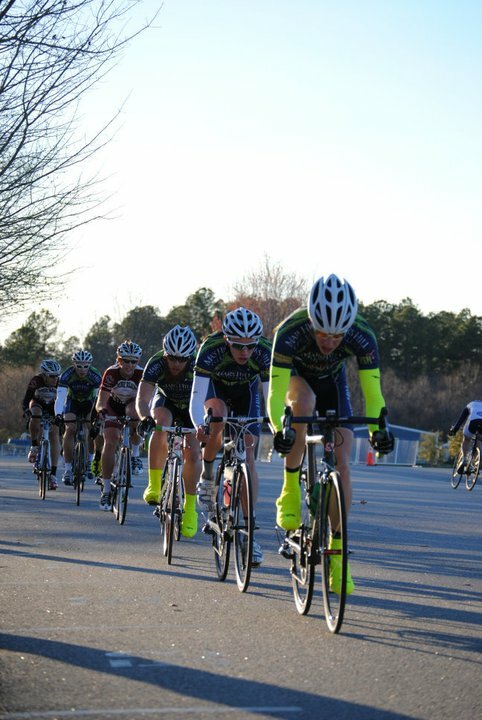 Willing, Jones, Webb, and Scherf chase during the crit. With an early start for the road races on Sunday, we were up at 5:45am to eat and pack up. The course was a 22-mile loop over flattish terrain. The A men started first, a race of three laps or 66 miles. 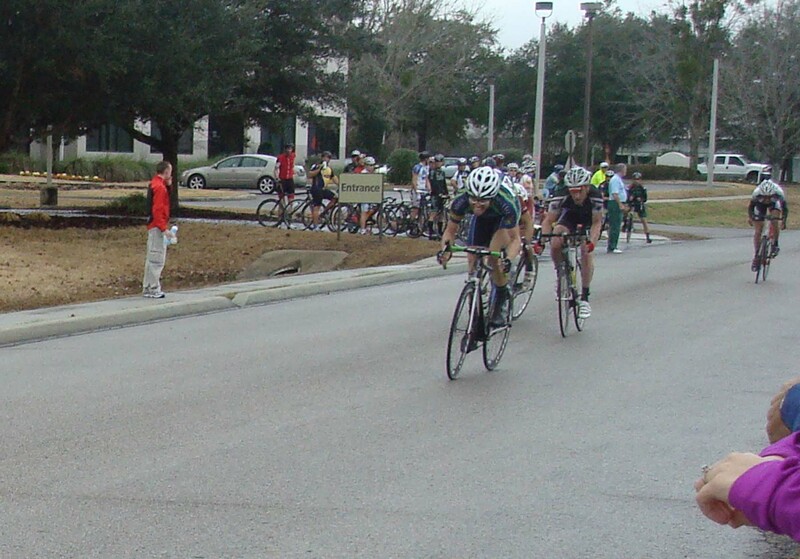 During the first lap, Sebastian Scherf escaped the field with Brian Arne (College of Charleston) and Kyle Rohan (UF). The three worked well together and built up over a two minute lead on the chasing field. Knowing that Scherf was a strong sprinter, we were confident in our chances of winning. As the lead trio came within 1k to go, Rohan got a front flat while Scherf was on his wheel. Arne took advantage of the opportunity and attacked. By the time Scherf was able to get around Rohan, it was too late to catch the winner and he settled for a strong 2nd place. Back in the field, Paul Webb managed to infiltrate the next split of five rider and led them home in 4th place. Matt Willing was 9th and Michael Robinson was 10th. A much better race for the A men than the day before. In the women’s A race, Stephanie Bunnett won the sprint from the lead group of four. Rossouw was 2nd and Colon was 4th. In the women’s B race, Cassie Adamson was on her own without teammates in a rather large field. Cassie was able to make the front group of seven and then followed an attack by Elisabeth Ferguson (King College) in the last kilometer and then came around her for her first win ever. Impressive riding from Adamson at her first bike races ever. In the men’s B race, Keith and Jenkinson tried to get away but the field was canceling out all attempts to break away. Understanding that a field sprint was likely, Keith made sure to keep Jenkinson out of the wind and then led him out in the sprint. Jenkinson looked like he had it but was overtaken at the line by Luke Correale (College of Charleston). In the men’s C race, Hill made the front split in the peloton and was in good position coming into the sprint. As the sprint for the line started, Hill found himself shuffled back and boxed in. By the time he found a free lane to open up his sprint, it was too late to win, but he still finished a strong 4th. Everyone was pleased with the weekend, especially with the progress made from Saturday to Sunday. Mars Hill won the weekend as best Div II team. We also racked up three wins and eleven podiums by individuals in combined Div I and II racing. Our next collegiate race won’t be for a few weeks, so this weekend most of the team is racing USAC races in Greenville, SC. As always, thanks to our supporters and sponsors. 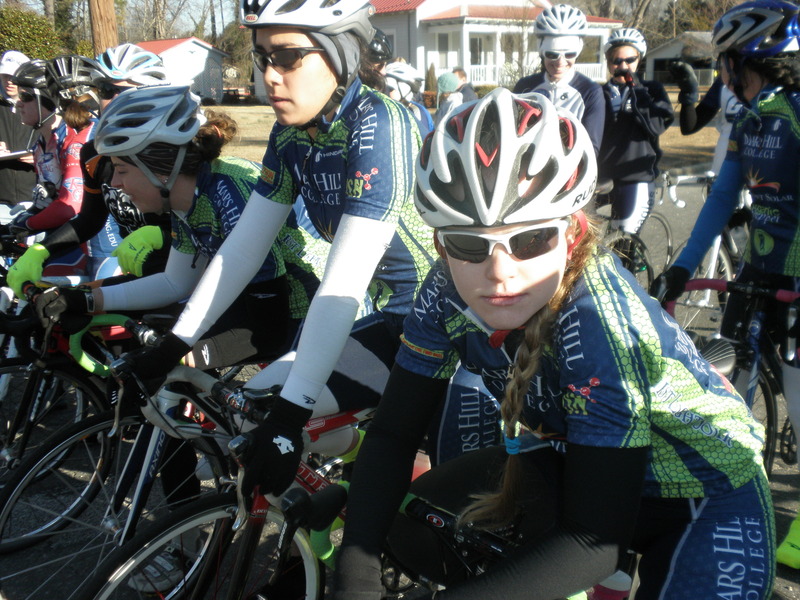 Stephanie Bunnett won Sunday's criterium in a field sprint. Michael Robinson wins Saturday's criterium from a 6-man breakaway. 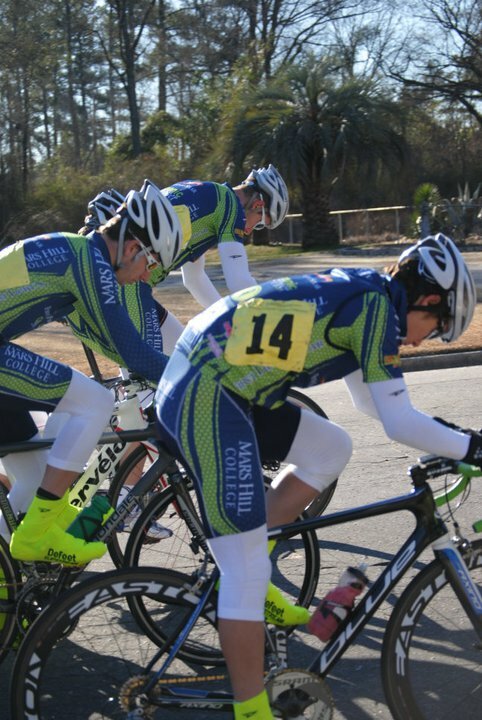 Michael Robinson, Maitland Jones, and Stephanie Bunnett all ventured down to their home state over the weekend to contest the first collegiate races of the road season hosted by the University of Florida. The long drive down from Mars Hill was rewarded by a trio of victories. Robinson started off the winning on day one by taking the sprint from out of a 6-man breakaway group. Maitland Jones worked to control the field and assure the break’s success and finished in 11th. Stephanie Bunnett also found the breakaway in the women’s A race and finished a strong 2nd. In the last race of the day, the individual time trial, Robinson powered around the short course to win in 4:59, five seconds faster than 2nd place. Jones finished his time trial in 4th place with a time of 5:16. In the women’s event, Bunnett had another strong ride and finished in 3rd with a time of 6:07. On Sunday, Stephanie Bunnett won the women’s race in a field sprint, demonstrating her all around capabilities. Robinson and Jones missed the breakaway in their race but still managed to finish a strong 8th and 9th. It was an excellent start to the road season as the team seeks to repeat its conference road title from last year and to defend it’s current #1 national ranking. The next race is at Georgia Southern this coming weekend, where MHC will bring a full team.